Or maybe it was the conception of a 3rd generation Managing Director of a family-owned 1900's manufacturing business that for more years than anyone cares to remember, had created fun coat hangers for friends and family. Coupled with some great young designers 'The Coat Hanger Company' was born to offer a comprehensive range of creative and novel coat hangers for all walks of life, bringing a smile to the simplest of everyday chores, 'using a coat hanger'. The Coat Hanger Company also offers a bespoke trade service for the point of sale and retail industries that need to add that personal touch. Please contact our parent company AWBL Ltd for further wire products and services. 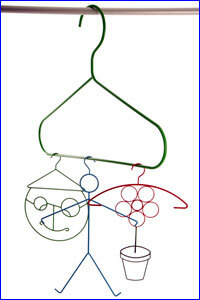 The Wire Coat Hanger was invented by Albert J Parkhouse in 1903. He worked for Timberlake Wire & Novelty Company in Jackson, Michigan, USA. US patent number: 822,981 was issued on the 25th of January 1904. Thank's Albert we owe it all to you!